Because cranking out legal dramas by the truckload is what CBS does, it’s already got another one in development. 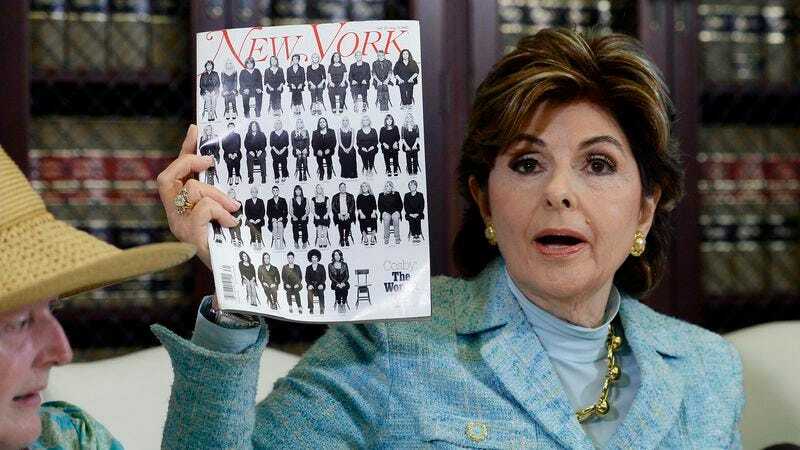 In addition to the “Tom Sawyer is a lawyer” show just announced, Variety reports the network is now developing a series inspired by the life of famed lawyer Gloria Allred. Allred will also serve as an executive producer on the show, though the project was created and will be overseen by Deborah Schoeneman, a writer for Girls and 90210 and a co-producer of The Newsroom. Using the feminist lawyer as the basis for the series, the show will revolve around a “fearless, outspoken lawyer who takes on the toughest civil rights cases and is masterful at using the media in order to get justice.” Which sounds familiar, possibly because as of now, there are only about twenty other shows featuring fearless, outspoken lawyers who take on tough cases. If this series really wanted to stand out, it might consider having its thinly fictionalized lawyer take on really pedestrian, easy cases—maybe a few jaywalking tickets, or a dog caught on film that keeps crapping in the neighbor’s yard. “With Hillary Clinton running for President, campus assault becoming a national crisis, and the number of Bill Cosby accusers continuing to swell, I think now is the perfect time for a legal drama inspired by Gloria Allred,” says Schoeneman, because she has taken the tactics of her subject matter to heart. No word on whether the show will use actual cases Allred has worked on as source material for its stories, but a barely disguised version of one of Arnold Schwarzenegger’s mistresses suing him would make for a good narrative, now that Schwarzenegger is acting again, and could play himself.